Over the past few years, violence against women in politics has received increased, and much needed, attention. It has become clear that we can no longer talk about women’s leadership without also talking about violence against women. Too often, violence is used as an effective tool to attack women seeking leadership positions, and to discourage other women from considering their participation. Violence against women in politics, sometimes referred to as VAWP, can take many forms including intimidation, sexual harassment, online violence and physical, sexual, emotional and economic violence. It frequently occurs in public and private spaces simultaneously. Aside from being a gross violation of women’s rights, violence obstructs women’s access to leadership roles and their ability to participate in, and influence, political processes. In fact, threat levels against women in politics appear to increase the more women are visible and influential in terms of policy-making. Why does violence against women in politics exist? At the root are harmful gender stereotypes and a belief that women and men are not equal. Gender stereotypes are rigid, over simplified and usually prejudiced views of the abilities and attributes of men and women purely based on their gender. The under-representation of women in political leadership impacts the ability of governments to respond to and prevent violence against women. Research demonstrates that having more women in government can lead to issues which are vital for women, such as ending violence against women, being put on the political agenda and addressed through policy and legal reform. While threats and violence are not the only barrier to women’s participation in leadership, the consequences of these actions are deep, long-lasting, and spread beyond the individual. Fear of violence can stop women from entering political life or deter women from running for a second political term. Violence against women in politics must be named as a human rights violation and a key barrier to women’s participation in leadership and decision-making. We must recognise that this violence affects women at all levels of leadership – from the local to global – and around the world. Legislation against violence is critical. The law should clearly define an act of violence against women in politics (at all levels of governance), as well as the available mechanisms for making a complaint and specific penalties for perpetrators. The equal representation and full participation of women in governance and political processes is critical for addressing this issue. Legislation is needed to guarantee women’s full participation in decision making at all levels. Provide training to police so they can recognise acts of violence against women in politics, and report and prosecute these crimes. Training should also be conducted for judges and legal professionals to raise awareness. Alongside these efforts, safe spaces must be created for women to report their experiences of violence, to access support and justice. Women’s organisations understand the challenges facing women, they should be supported and resourced. Specialist service providers are also essential to provide support to respond to VAWP and to develop prevention strategies in each local context. Data on violence against women in politics is lacking. There is a need for the development of indicators and data collection to provide evidence on the prevalence, form and impact of violence against women in politics at all levels. Good practice in relation to laws and policies, parliamentary response mechanisms and research should be tracked and shared across countries. What are IWDA partners doing? 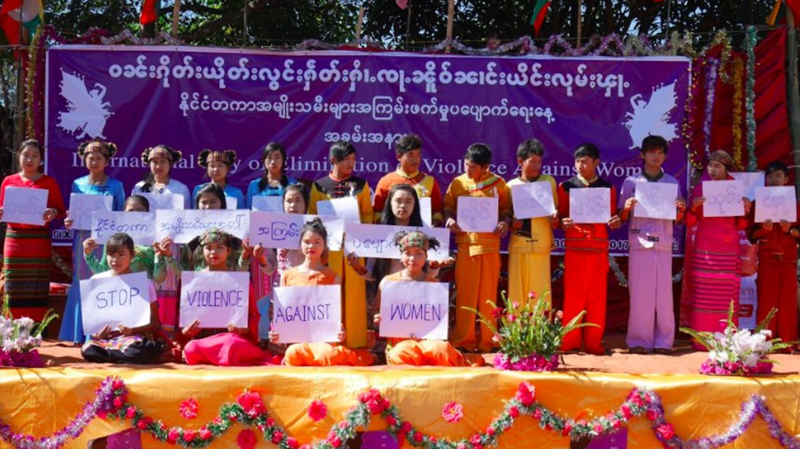 IWDA’s WAVE program supports women-led action to prevent and respond to violence against women. This is to ensure women can live a life free of fear and have the necessary support and opportunities to lead. Under the Our Voice campaign, WAVE partners are coming together to demand the increased representation and effective participation of women in decision-making at local levels across Asia and the Pacific by 2020. As part of the 16 Days of Activism, Our Voice partners are raising their voices together to shine a spotlight on violence against women as a barrier to women’s leadership. Download the full brief – Our Voice: Violence against women is a barrier to women’s leadership here. WAVE is a ground-breaking women’s leadership program that brings together and supports individual women, organisations, and movements in Asia and the Pacific region to increase the representation of women in diverse leadership positions. WAVE is funded by the Government of the Netherlands and supports 18 women’s rights organisations in five countries with the resources, skills and networks they need to amplify their collective voice and create a more enabling environment for women’s leadership.